Home|Floral Library|Larkspur – Consolida spp. Harvest when 2-5 flowers are open. Related species include buttercup, clematis, anemone, monkshood, peony. Flowers are 1/2 inch wide, cup-shaped with a spur at the back and many occur in a long terminal spike. 36-38F (three days or less), 32-34F (more than three days), dry storage not recommended. Consolida is from the Latin “to make whole” referring to possible medicinal properties. As a garden plant it is often plagued with insect and disease problems. The species often used for cut flowers are C. ambigua which is branched and in colors of light pink or blue and C. orientalis which is more upright and in bright pink and purple. Morphologically, it is different from a delphinium in that its two upper petals are united into one and is lacking the two lower petals. Regardless of this distinction, most cannot tell the difference between these two genera. Suitable for drying, hang upside down in ventilated area at 70-80 F for 2-4 weeks. When purchasing, try to avoid hollow-stemmed ones and those infested with mildew (leaves look gray). Harvest when 2-4 flowers are open. 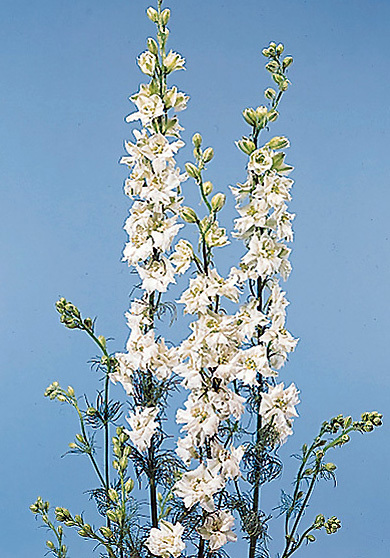 With hundreds of dainty flowers clustered on a single stem that swoops dramatically upward as if reaching for the sky, the Larkspur makes a stunning addition to any arrangement.